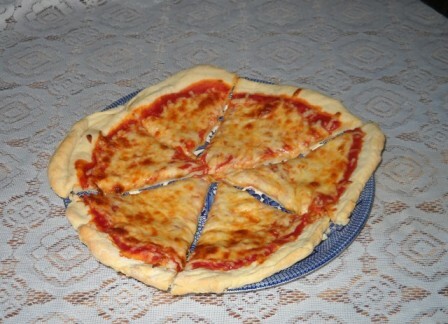 Here is my biscuit pizza crust can be whipped up quickly…and is very filling for hungry teenagers. We normally have this when only a couple of the children are at home. It serves 4, but could easily be doubled to serve 8. Any leftovers can be saved in the fridge and reheated the next day. Mix together the flour, salt, and baking powder. Add the vegetable shortening. Use a fork or pastry cutter to press shortening into the flour mixture, until it resembles course crumbs. Add milk. Stir. Knead dough on a lightly floured surface. Cut biscuit dough into four equal sections. Roll out one of the doughs into a flat, circular shape, around 8″. Place dough onto a cookie sheet or round cake pan. Pre-cook for 2 minutes. Bake for around 10 minutes, or until cheese is bubbling and center of the crust has cooked through. Love easy, tasty recipes that are fun for the family. Nice biscuit pizza recipe, thanks for sharing. My mother-in-law gave me a similar recipe as part of a wedding recipe book, but mine is made in a jelly-roll pan deep-dish style. A favorite for dinner, but too much for my husband and I when there are no kiddos at home. I never thought of doing it like this, but I’m gonna give this a try! The kids will love trying this! Thanks! Anything with ‘pizza’ AND ‘biscuit’ in the title is a sure hit! Thank you. I love biscuit pizzas. I actually like buying those really cheap, not so amazing, canned biscuits (like the ones that are almost rockhard when you cook them appropriately, are tiny, and no layers…for like $.35 a can). They’re great for flattening out for quick mini pizzas.